The rise of streaming services such as Netflix is making many wonder why they are paying a cable provider $150 a month when Netflix costs $10.99 for a multiscreen experience. Make no mistake video streaming is already changing the fan viewing experience. The digital transformation of sports appears to be taking shape as NFL recently revealed they were embracing blockchain with their latest SportsCastr and FanChain deal. SportsCastr is an ultra-low latency live video platform for sports that brings studio-quality features to anyone with an iPhone, including real-time score-bugs, broadcast quality motion graphics and augmented reality. In addition to being a powerful second-screen experience that allows viewers to personalize the commentary for any game (or to jump in and share their own reactions), the Company is developing unique social OTT functionality that combines SportsCastr’s technology with live sporting events (including esports) — opening up a new paradigm for how fans watch the game. The sports entertainment startup is advised by some of the industry’s biggest names, including NBA Commissioner Emeritus David Stern, NFL tight end Vernon Davis and NCAA men’s basketball coach Jim Boeheim. But the recent announcement that the National Football League Players Association (NFLPA) has acquired a minority stake in the company put the company on my radar. In June, SportsCastr announced FanChain, a cryptocurrency developed for the multi-billion-dollar global sports market. FanChain allows SportsCastr users to earn tokens for participating on the platform, and those tokens can then be used to unlock premium NFL player content (such as backstage access), purchase sports tickets or merchandise, and send virtual gifts to NFL players. Although SportsCastr is the first platform to support FanChain, the company is working with teams, media publishers and leagues to add FanChain support, with the aim of making it the ubiquitous token within the sports industry. 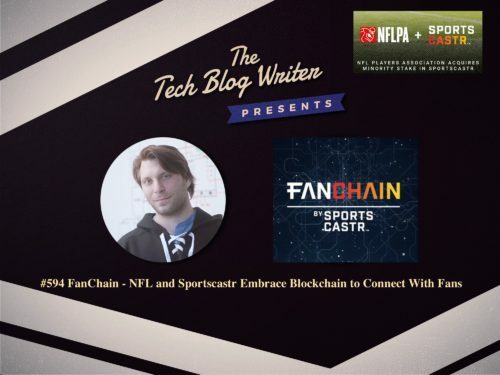 Nick Schupak is the Co-Founder and Vice President of Community at SportsCastr and I invited him to today’s tech podcast to learn more about the interactive live-streaming app; and FanChain, the cryptocurrency developed to connect the fragmented sports industry.